Butterflies aren't necessarily "autumn-y" - but that's no reason to let your Maribelle Butterfly Die 98156 and the coordinating Selena Butterfly Die 98159 hibernate till next summer. They're used here with the great prints from the Blackbird 6x6 Set - and an overlay of Soiree Copper Shimmer Cardstock. 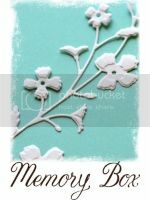 Save some of the little cutouts - then place them back into the intricate Maribelle diecut for added detail. I often bring some of my blog cards to class with me so you can see them - up-close and personal - for all of the wonderful details Dave has designed into his products.